On January 27, 1973, an accord was signed to stop the war between the US and North-Vietnam. Present at the signing were Henry Kissinger and William Rogers, representing the USA; and Le Duc Tho, Ms. Ngyuen Thi Binh, Tran Van Lam, and Ms. Ngyuen Dui Trin, representing North-Vietnam. Photo #149. 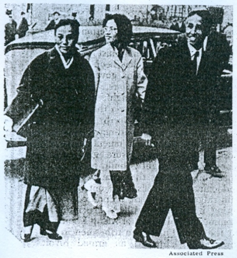 North-Vietnam’s delegation to the Paris Peace Conference on January 27, 1973. From left to right: Ms. Nguyen Thi Bin, Ms. Duy Trinh and Tran Van Lan. The peace agreement was very damaging to the US in every aspect, including political and military. It signaled the greatest defeat never seen before in the US and Laos history. 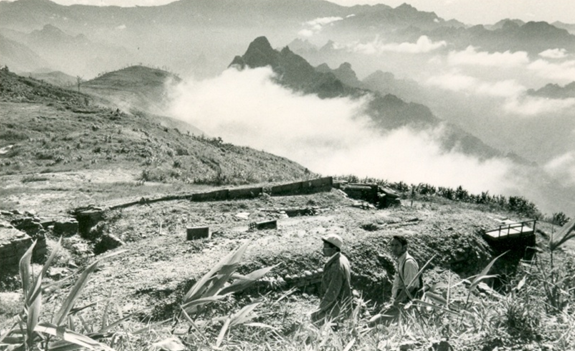 At that time, North-Vietnam only had a population of 15 millions (less than 30 millions for both the North and South) and was one of the poorest countries in the world. By comparison, the US had a population of over 300 millions, was the most developed country in the world, and a superpower. The US had to retreat from Vietnam as a loser, scrambling to get out at the last minute, and had to leave everything behind. By contrast, North-Vietnam continued to attack the US allies (Cambodia, South-Vietnam and Laos) very methodically, step by step, without any concern for the US and the agreements signed in 1954, 1962 and 1973. Therefore, the Vietnam War was a war that deserves to be analyzed in more detail as lessons learned for Lao, Cambodians and Vietnamese. It appeared that Henry Kissinger’s visit to Laos and South-Vietnam on February 9, 1973 was just to tell the Lao rightists to surrender to the Communists, because the US had to pull out of Laos, Cambodia and South-Vietnam –countries that fought with the US, believing that the US was a superpower and had a good exit plan. But the US had no choice but to leave Indochina because Soviet Russia was strongly supporting North-Vietnam. Retreat to the jungle and continue the fight to avoid being taken prisoners and seeing the Vientiane rightists killed like animals because they were the losers. It was determined that this option was not feasible and would not work, because the North-Vietnamese and the Lao communists would eradicate the Hmong first and then the pro-Vientiane Lao and the communist followers. The Vietnamese wanted to take over Laos as their colony. This option would certainly not be safe to implement. Seize Sayabouri Province and use it as a command center. If the enemy does not choose to attack the area, try to develop it. If not, be prepared to fight back because Sayabouri is close to Thailand and allows for easy communications between the two countries because Thailand is not a communist country and used to be an ally in the Vietnam war. This alternative was not found to be safe either, because no less than 70 percent of the population of Sayabouri Province were pro-communist. Ask for asylum in Thailand, waiting for the right time to come back to Laos. For sure, Thailand does not have any land to spare for use as a long-term residence area for refugees from Laos. The chance of success of this option was also very dim because of the many potential political issues that may arise that would be difficult to resolve. Ask for support for the US and admission that this fight was part of the US policy to curb communist expansion to South-East Asia and the rest of the world. Perhaps, the US might be able to help us, but we need to check further with their Embassy. 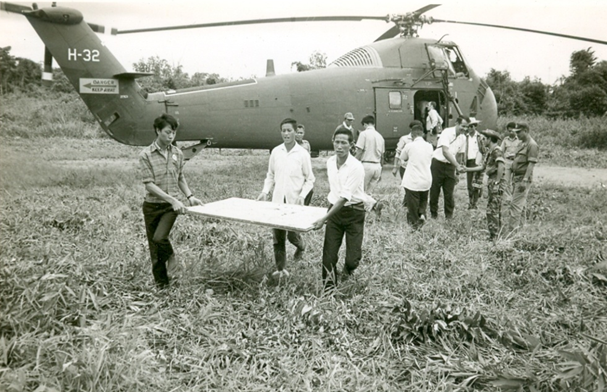 As the meeting note-taker, Gen. Vang Pao sent me to Oudone, Thailand on May 10, 1975 to bring US helicopters in to transport the 3,500 military officers mentioned earlier to the US Ambassador. We also ordered more lights be installed along the runways, as the US military planes would only fly in at night. When I arrived in Oudone, the US officials decided to use C-130, C-46 and C-47 aircrafts instead. As a result, I had to stay in Oudone and never had a chance to see Long Cheng again since that time. I had to go and greet people that were flown in from Long Cheng, and took them to their assigned dwelling units at the Nam Phong Refugee Camp. Each dwelling unit was equipped with a nice kitchen. In less than a month, all the units were full of refugees. It took three and half days during May 11-14, 1975, to transport all of Gen. Vang Pao’s people to Namphong Camp in the Province of Khone Ken, Thailand. 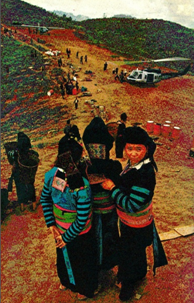 Once the planes stopped air lifting, many Hmong who were left behind searched for other ways to leave MR-II for Thailand. Many other people, including parents, relatives, assistants, nieces and nephews followed suite in large numbers by cars, walking across mountains and jungles, heading toward the Laos-Thailand border line near Nongkhay, Thabor, Leui, Phayao, and many other sites to the north and the south. The Hmong and Lao people from MR-II fled to Thabor, Nongkhay and Namphong Camp. Those from MR-I (Louang Prabang, Sayabouri and Louang Namtha) fled to Nane, Changwath Leui and Chanwath Phayao. The border of Thailand was flooded with Hmong and Lao refugees fleeing from their country. The refugee population quickly grew in size and soon found no where to stay, creating security problems to Thailand, which then ordered its border closed. Later on, the Thai and US governments opened several more refugee camps while also forcing many Lao leaders to leave Thailand for a third country in early June 1975. In November 1975, Namphong Camp started to close its doors to refugees. In 1976, the camp was entirely closed and the refugees who used to live there were transferred to the newly-created Vinai Camp. At Vinai Camp, Hmong and Lao refugees came from Thabor, Nongkhai, and Nam Phong Camps. When people lived together under a not so-well organized housing authority and with interferences from scores of bad guys, several issues arose that pushed the Thai government to move the lowland Lao refugees to the Na Pho Camp, Thailand. 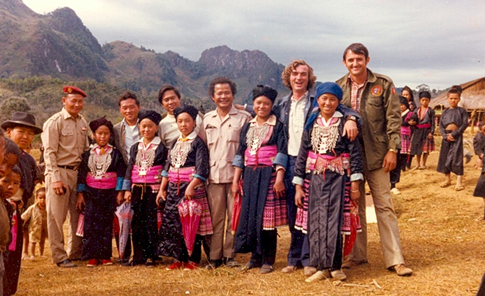 In February 1976, the US began to grant entry permit to Lao and Hmong people who had worked for USAID and the CIA. Later on, churches in the US helped in securing entry visas to the US for Christian families from Laos and those who served in the Vietnam War. The US continued to allow those refugees to come to the US until 2006. May the Lord bless the US and several other countries who loved and cared for refugees from Laos who have just lost their country, had no shelters, were desperate, disappointed, not used to the situation they were going through, were deprived of their roots, and had to leave their families and close relatives because of tragic life changes. Jerry Daniels was an agent of the US Central Intelligence Agency (CIA) who came to help MR-II fight against the communists. He had worked alongside Gen. Vang Pao from 1968 until 1975 under the war nickname of “Hog” (wild pig). During 1971-1972, Jerry Daniels managed all military assistance programs to MR-II. From 1973 to May 1975, he oversaw post-war economic development in the field of social affairs, agriculture and cattle raising –buying cattle from Thailand and giving them to local residents to grow. He created several development centers in MR-II, including Nam Goua, Nam Pha, Phak Khae, Nam Mo, Thong Mieng and Muang Decha. In addition, he started implementing several projects involving tree plantation, growing medicinal and other types of plants. When the war raged in MR-II, people had to immigrate to Thailand. During 1975-1980, Jerry Daniels coordinated food assistance programs to MR-II refugees at Nam Phong and Vinai camps. He helped the MR-II refugees find opportunities to immigrate to the US. On April 28, 1982, Jerry Daniels passed away at his Bangkok, Thailand residence. An official announcement was made about his death and his body was brought back to the US for burial in Montana in mid-1982. Photo #150. Phou Koum’s airfield (LS50) between Xieng Khouang Province and Houaphan Province fell into the enemy hands in 1969. It served as a behind-the-line airfield. Photo #151. 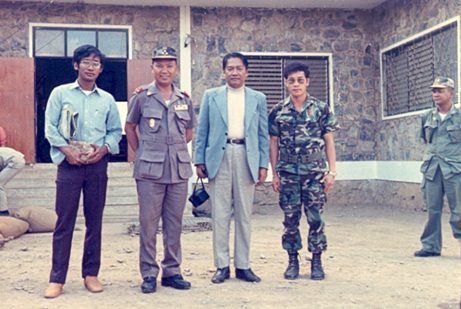 Gen. Vang Pao (in the middle), Col. Vang Geu (right with a watch) and Thai and US experts. Photo #152. 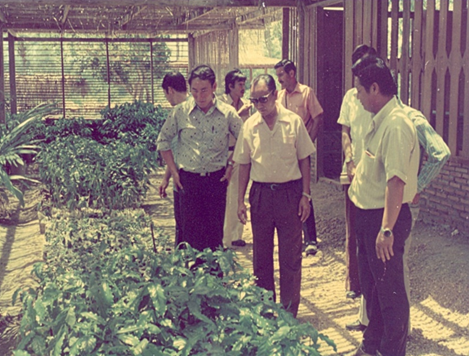 Gen. Vang Pao, Col. Vang Geu, and Jerry Daniels on their visit to agricultural projects in Thailand, were being briefed by Thai agricultural expert Souvicha in 1973 in Chiang Mai. Photo #153. From L to R: A Thai mineral expert, Gen. Vang Pao, Dr. Souchit Hiranprouk, Col. TouFu (the first Hmong who graduated with a B.A degree in 1968 from USA, rare fact for the Hmong people. 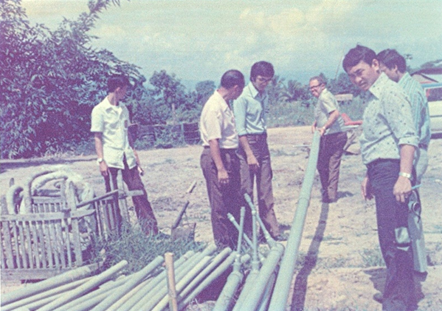 TouFu became the inevitable spokesman of the general VP to his friends CIA and worked in close cooperation with him from 1968 up to their departure of Laos to the U.S.A), and Lt. Col. Thao Na (MR-II construction project manager). 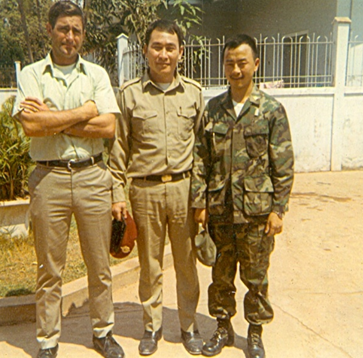 Photo taken in 1975.
in MR-II working on projects sponsored by Col. Vang Geu and Gen. Vang Pao. 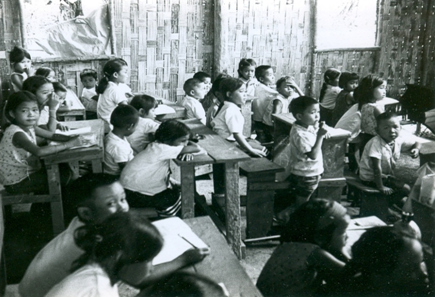 In 1966, IVS invited Larry Woodson to serve as deputy-project manager for educational programs in many Lao provinces. Furthermore, he also taught English at the Lycee (high school) and the German Technical School in Vientiane until 1969, with contract extension every two years. 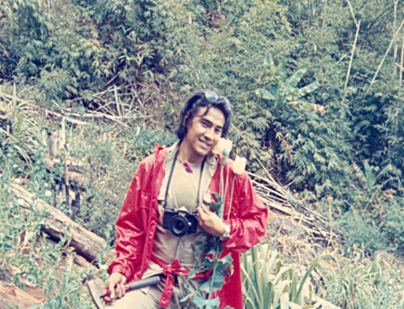 In 1969, he was promoted to the position of Volunteers Program Manager working at the Sisavangvong University in Dong Dok near Vientiane, with the task of recruiting English teachers and other languages instructors. In 1971, he was hired by USAID as education counselor for refugees, working in the Laos Ministry of Education’s Primary Education Department. He traveled everywhere to each and every refugee resettlement site from north to south, to look at educational needs of each village in terms of school supplies, teachers, students, class-rooms, black-boards, desks, chairs, etc. All told, this might have involved no less than 19,000 students that were in need of teachers and schools. He set up about 4,000 additional class-rooms. Photo #156. –A burnt down school in MR-II. Larry Woodson ordered helicopters to bring in wood repair material. Photo # 157. Civilian workers carrying in wood repair material to rebuild a school that was burnt down by the enemy. Larry Woodson was the main sponsor for this program, using US HT 34 helicopters. In 1974, Larry Woodson was tasked by the US Ambassador to facilitate agricultural and livestock programs in MR-II. He traveled several times to Long Cheng to coordinate delivery of domestic animals to the Hmong and Lao population in that region (including swine, water buffalos, and cows) at the request of Gen. Vang Pao. Yang Yee served as his counter-part on this project, buying cattles and delivering them to several MR-II sites. Larry Woodson had those cattles delivered to Bouam Long (LS32), north of the Plain of Jars, and to Long Cheng’s farmers. These animals were to be raised by local farmers as part of a post-war program designed to help local residents become self-sufficient during times of lesser foreign assistance. Due to the changes in the political climate, Larry Woodson had to leave Long Cheng one Friday and then leave Laos altogether. He was sure Long Cheng would be captured the following Wednesday. Three days later, the USAID compound in Vientiane was also damaged. Photo #158. Finally, many children were able to go back to school thanks to the US material assistance coordinated by Larry Woodson. [Thank you very much, Larry!]. Photo #159. Larry Woodson and his friends. From left to right: Col. Vang Youa, Mua Dang, Pahom Sundara, Dr. Louat, Graham Hunter(an Australian), Larry Woodson (US IVS) & many unknown girls residents of LS 37, Muong Phoune near Vang Vieng.